Torticollis means ‘twisted neck’ and is caused by damage to or a shortening of the Sterno-cleido-mastoid muscle (SCM muscle) in a baby’s neck. Congenital Muscular Torticollis (CMT) can be caused by in-utero positioning, lack of space in the uterus, a traumatic birth, a multiple birth or low amniotic fluid. Some babies have an actual tumor in the SCM muscle, while other babies just have tightness or thickness in the SCM muscle. Some babies may have no tumor or tightness, but have asymmetric neck posture due to eye problems, congenital absence of cervical muscles, low muscle tone or general delayed development. Associated problems can include hip dysplagia, clubfoot, and brachial plexus injury. Torticollis can also be positionally induced or environmental. 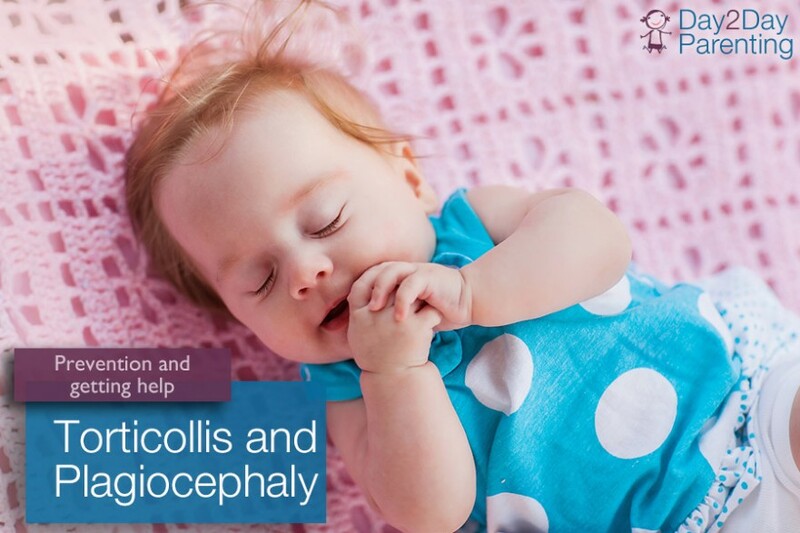 We are seeing more and more babies with torticollis ever since the Back to Sleep campaign began in the early 1990’s to combat Sudden Infant Death Syndrome. Because all babies are sleeping on their backs now, the muscles in the neck and upper back aren’t being stretched out as they were with tummy sleeping. Learn more on our Torticollis and Associated Problems page. Plagiocephaly refers to any condition characterized by a persistent flattened spot on the back or side of the head, and is sometimes called Flat Head Syndrome. Plagiocephaly can be pre-natal, again due to a restricted uterine environment, lack of amniotic fluid, multiple births or increased abdominal or uterine muscle tone. As with torticollis there has been a recent dramatic increase (some experts say a 5 fold increase) in the number of babies with positional plagiocephaly. This is also due to babies sleeping on their backs and not receiving tummy time during awake periods and also due to babies spending too much time in car seats, swings, infant carriers, etc. How Can I Prevent My Baby from Developing Positional Torticollis and Plagiocephaly? Tummy time! We can’t stress enough how important supervised tummy time is during your baby’s awake periods. Try tummy time with your newborn for small periods and try to build up the time that your baby can tolerate being in this position. During the first three weeks of life, reflexes are present which allow infants to clear their heads to breathe and also to breathe against the resistance of the floor. Secondly, limit the amount of time that your baby spends sitting or lying in any piece of equipment (car seat, bouncer seat, swing, etc). Alternate the end of the crib in which your baby sleeps. Alternate the end where you place your baby’s head on the changing table. Place toys on different sides of the stroller, bouncer seat and swing to encourage your baby to turn his head to both sides. What Should I Do if I Suspect My Child Has Torticollis and/or Plagiocephaly? If your baby’s head remains constantly turned to one side or the other, is tilted or if his neck muscles seem tight, see your baby’s doctor. If his head is asymmetrical beyond age 6 weeks, or if you start to notice a flat area after 6 weeks of age, you will also want to see your baby’s doctor. You can call the Alliance for Infants and Toddlers (Pittsburgh Area only 412-885-6000) to receive Early Intervention Services (usually physical therapy) through ACHIEVA (babies with severe plagiocephaly may also have prominent foreheads, misaligned ears, and uneven facial features.). Babies with torticollis and/or plagiocephaly benefit greatly from weekly physical therapy which includes stretching exercises to stretch the neck muscles and proper positioning to enable the baby to freely turn his head from side to side and to not keep it turned to one side or the other to prevent further flattening. 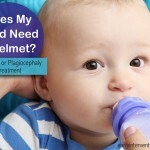 Some babies with plagiocephaly will require Dynamic Orthotic Cranioplasty (DOC), which simply means being fitted for a helmet that they will wear to re-shape their head to a more normal position. It is best to catch torticollis and plagiocephaly as early as possible, definitely before a child turns one year of age, although research has shown that DOC can be effective for children who began treatment as late as age 20 months. What if My Child’s Torticollis and Plagiocephaly is Not Treated? How Will A Therapist Treat My Child for Torticollis/Plagiocephaly? Your therapist will work with your family to show you simple stretching exercises for your baby that include both passive and active range of motion. They will demonstrate proper positioning both while in equipment (car seats, high chairs, swing) and when being held so you can encourage proper alignment and stretching of your child’s neck, trunk and hips. They will show you ways to incorporate age appropriate tummy time, how to work on sitting and transitioning in and out of different positions (sit to crawl, kneel to stand, etc) and exercises that promote reaching upwards to obtain toys. They may also teach you massage techniques. Studies that have looked at neck range of motion report that the outcomes show good to excellent results for children who began treatment before age one. The goals are for a child to achieve full range of motion in his neck, trunk and extremities, gain active symmetrical head rotation to each side, have good head to trunk alignment during play, have equal strength on both sides of the body, as well as good symmetry. What are the Symptoms of a Sensory Processing Disorder?